Kristin Bock’s potent and undeniably original voice sings through this award-winning first collection. Enticing readers with transcendental pastorals, her spare wordplay is tinged with gothic imagery yet laced with an easy innocence. These are poems that enlighten and arouse, assuring us that if nothing on Earth may be taken at face value, neither may anything be taken for granted or lost. They say I shouldn”t think of you. is turn you into something. to kiss an orchid. Free the sickle from its rust. haunting the halls of shells marooned at our feet. half-buried in sand, half-eaten by a slow, salty wind. Kristin Bock holds an MFA in poetry from the University of Massachusetts, Amherst where she teaches in the Business Communication Program. 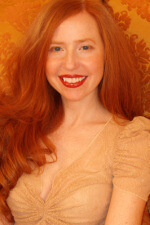 Her first collection, Cloisters, won Tupelo Press’s First Book Award and the da Vinci Eye Award. Her poems have appeared in many journals, including The Black Warrior Review, Columbia, Crazyhorse, FENCE, Pleiades, Prairie Schooner, Salt Hill and VERSE. Bock is also a founding editor of the literary magazine Bateau, and a Massachusetts Cultural Council fellow. She lives with her husband, artist Geoffrey Kostecki, in Montague, Massachusetts and together they restore liturgical art.